This is because the Ubuntu PHP is set to discard the script file path and not set SCRIPT_FILENAME in the environment. I have yet to find a magic bullet for this issue when using Ubuntu's php build. I am having a similar experience under Archlinux (not Ubuntu) using Komodo 4.1.1, build 279677, platform linux-libcpp5-x86. Regardless of the cgi.force_redirect setting, I get the 'No input file specified' message upon debugging with CGI Emulation. I see that the Debugger Configuration wizard sets cgi.force_redirect to 0 in its "copied" php.ini (along w/ the xdebug reference). The only way I found around this issue was to manually set the SCRIPT_FILENAME as a CGI environment variable. Set this to the absolute path of the .php file to be debugged. Does anyone have other ideas for a fix? Restart komodo and your CGI scripts should debug properly. Your fix worked perfectly. Thanks for the prompt response. What else could be causing this? I've tried everything above with no luck. Thanks for the help Todd. Komodo IDE, version 4.4.0-beta1, build 19400, platform win32-x86. Built on Fri May 30 02:25:59 2008. I also tested with c:\www\php5\php-cgi.exe and received the same results. I verified that those parameters are commented out everywhere else in the php.ini file. 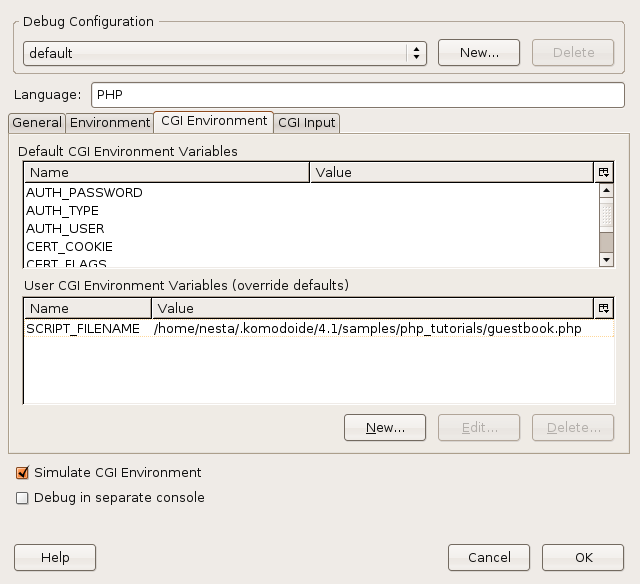 I choose "Use the CGI interpreter"
I check "Simulate CGI Environment"
and I add the post values according to the debugging PHP tutorial / demo. It works if I choose "Use the CLI interpreter", but then it doesn't allow me to specify the post variables. The only thing I can think to add at this point (in case it helps) is a copy of the php.ini along with lists of extensions enabled in php. It looks like doc_root setting in the php.ini bundled with Web Developer Suite 2.0 causes problems for the remote debugger. Comment out that line in c:\www\php5\debug\php.ini and it should work. Thanks for bringing this to our attention! We'll create a bug for Komodo to handle this better and mention it in the release notes, but it's unlikely to be fixed in time for the 4.4 release.